YEREVAN, SEPTEMBER 10, ARMENPRESS. 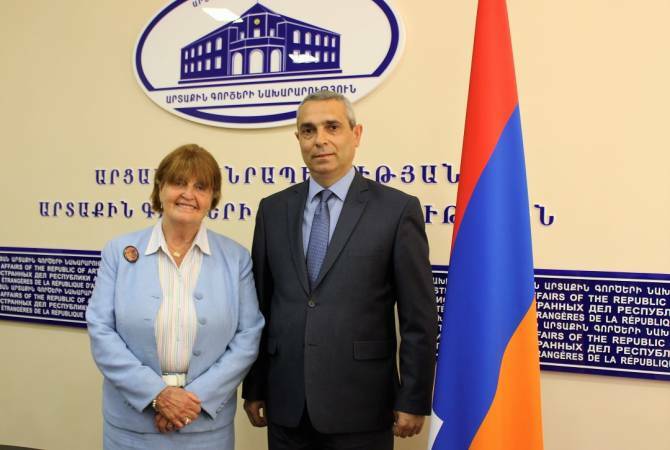 On September 10, Minister of Foreign Affairs of the Republic of Artsakh (Nagorno Karabakh Republic) Masis Mayilian received a delegation led by Baroness Caroline Cox, member of the House of Lords of the United Kingdom of Great Britain and Northern Ireland, the Artsakh foreign ministry said in a press release. Welcoming Caroline Cox’s visit to Artsakh, the Minister noted its importance from the point of view of observing the current situation in the republic and the achievements in different spheres. The Minister highly appreciated her consistent efforts aimed at protecting the rights and legitimate interests of the citizens of Artsakh abroad, raising awareness of the international community on Artsakh, disseminating truthful information about the conflict between Azerbaijan and Nagorno Karabakh, as well as solving humanitarian issues in the republic. During the meeting, Masis Mayilian touched upon the current stage of the Azerbaijan-Karabakh conflict settlement process, presented the achievements in the international recognition of Artsakh and decentralized cooperation with the subjects of different countries of the world, as well as answered the questions of the delegation members. Minister of Foreign Affairs of Artsakh awarded Baroness Caroline Cox with the memorial medal dedicated to the 25th anniversary of the establishment of the Artsakh Foreign Ministry. Edited by onjig, 10 September 2018 - 06:22 PM.